"What Do I Do After An Agent Asks To See My Manuscript? First, call them. Try to sound confident. Ask a few questions about their business, such as: Who are their current clients? What do they consider their strengths? What do they think makes their agency special? etc. Now it's time to talk about you. Tell him/her what you have had published (magazine articles for example) or contests you have won, ask what questions he/she would like to ask you. These phone calls will give you a sense of who you feel comfortable with and who you think will provide you with the best deal. Take notes for your final evaluation." Ummm, I just sent the ms as requested and plan to wait for a reply. Am I right to think that following the above advice would qualify me for nitwit of the day? yes. Not just the day either. Anyone who tells you to do this is not only a nitwit, they are so wrong as to be suspiciously malicious...are you sure it wasn't a joke? I gotta tell you, if you call me up "just to chat" about who my clients are and tell me about your magazine pieces and find out why I think I'm special, I can tell you right now that you are "not quite right" either for my list, or in the head. It's not the content, it's the timing. You don't start calling agents up until they've said "yes this manuscript is something I'd like to take on". Until that point, whether you think they are perfect for you or not is irrelevant; the agent hasn't decided if s/he thinks s/he can sell this. There's not that fine a line between being careful and being a nitwit. Does that mean you don't want to tell us why you're special? (snicker) my werdverf is oxnvu.. about what that clueless advisor's seein; northbound end of a southbound ox! The moral is this: don't believe everything you read on the internet, and ALWAYS run dubious material by the sagacious Miss Snark. 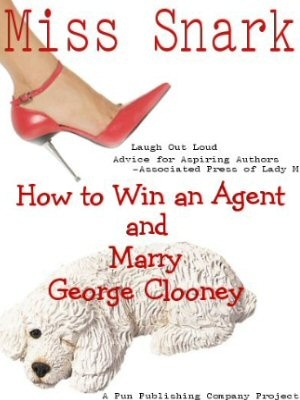 Randomly, don't you think that advice was originally given in response to the question "What should I do if an agent says they'd like to rep the manuscript?" ...don't you? I mean. It must have been. Be sure to ask the agent their astrological sign. Last thing you want is someone whose moon is out of alignment with your own. Oooh- and also ask them who they were in their past lives in case you had a previous bad working relationship back in the 1700's. I just visited the site, and it gets so much worse. They recommend that you should follow up with the agent "a few days to a week" after sending the manuscript to check the agent's progress. don't you think that advice was originally given in response to the question "What should I do if an agent says they'd like to rep the manuscript?" Second, send your manuscript to the agency you have decided is best suited to you. Third, send notes to those you did not choose and tell them that your manuscript is out to an agency but you would like to remain in touch with them. Be honest, but leave the door open for further consideration. Remember, the agency you chose might not choose you! Notice that it doesn't say "send notes to those you did not choose [hey, why not call them??] and tell them that you've decided to sign with another agent." According to this advice, you should only send your full out to one agent at a time--effectively granting an exclusive to someone who didn't even ask for it. After that initial phone call, though, the only thing the agent would probably want to ask such a writer is, "Would you please leave me alone?" Actually, Cheryl, what they said was to ask the agent how long before you can expect a response and wait a few days or a week AFTER the that to query if you have not heard. Reading over the site, it seems pretty right on except for that one passage quoted to Miss Snark. It even tells you to avoid fees, sends you to Writers Beware and so on. I am guessing they are either ignorant of the querying process or, as another poster suggested, meant to say "after the agent asks to represent your ms."
Yeah..."Sorry, but I decided not to send my manuscript to you to read, because I spoke to a different agent I like better. If they don't want it, though, I'll send it to you, OK?" And this is just to an agent who requests a full! WTF? Now THAT's the way to win friends in the publishing business! Gotta love those ebook people. There's a fine line between stupid and clever. This "expert" was too clever by half.